ENGLEWOOD, Colo., August 30, 2018 (Newswire) -The 2018 hail season seemed to come later in the year for the state of Colorado; however, no homeowner ever welcomes hail. While this season’s storms were not as devastating as 2017, the economic impact is being felt by the insurance companies. Estimates thus far indicate more than $3 billion in economic losses for those impacted by storms within the first six months of the year. Through Aug. 17, 2018, NOAA is reporting 486 incidences of hail, wind or tornados for the state of Colorado and a total of 15,921 incidents across the Contiguous U.S., Alaska and Hawaii. Colorado leads the list for the total percentage of hail incidents at an estimated 66 percent of total tracked storms. About MADSKY MRP LLC: MADSKY is the first roofing-focused managed repair program (MRP) in the country, providing access to unmatched pools of vetted and trained professionals across the roofing repair process. MADSKY’s “network of networks” is the largest collection of roofing contractors in the U.S., consisting of more than 3,000 certified roofing contractors and a supplier network of more than 3,600 across all 50 states. MADSKY’s proprietary Frictionless Customer Experience (FCX) software connects the carrier, contractor and consumer, allowing for seamless communication and optimal utilization of all resources. 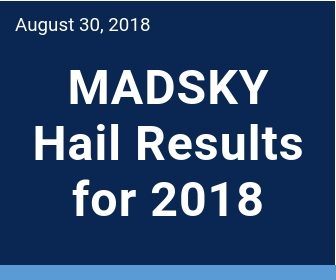 Headquartered in Englewood, Colorado, MADSKY is quickly redefining and enhancing the insurance claims experience for roof repairs and/or replacement.